Archiving projects (an exclusive feature for organization accounts) is a great way to keep your finished work private without having to increase your bill. An archived private project will stay private, and you can view the project, its presentations, and its shared/embedded versions at any time. Archived projects don&apos;t count toward your total private projects—for monthly plans, this means that your next charge will be pro-rated based on when you archived the project and removed it from your bill. For annual plans, archived projects won&apos;t count toward your private project limit, however, to make sure that change is pro-rated on your next bill, you&apos;ll need to decrease your private project limit on your organization&apos;s settings page. Note, however, that you won&apos;t be able to edit the archived project, create new presentations or shared/embedded versions of it, or leave comments, unless you unarchive the project first. 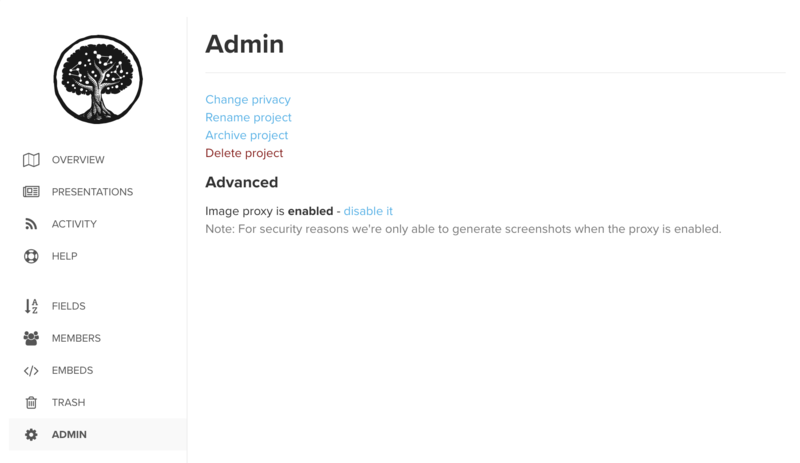 To unarchive a project, send an email to support@kumu.io with a link to the project, and our team will take the next steps. A $20 unarchiving fee will be billed to the account owner when we unarchive the project, and unarchiving may take a few days. To archive one of your projects: open the project, then click the menu icon in the upper left corner to open the project settings. Select Admin, and click Archive project. Project archiving is an exclusive feature for organization accounts.